4 star hilarious and action packed comedy horror. 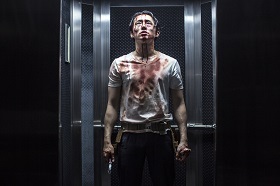 Mayhem is written by Matias Caruso (The Doll Maker, Numbers) and directed by Joe Lynch (Everly, Knights of Badassdom). The film opens with our ‘hero’ Derek Cho (Steven Yeun – The Walking Dead, Okja) narrating the current state of the world. A virus has emerged, known as ID-7 or the “Red Eye” virus because it causes one eye to turn red, which causes people to lose all inhibitions and act out their darkest impulses. 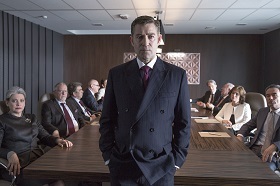 Derek works for Towers and Smyth Consulting, a large law firm who fought and won the first case regarding murder committed under the influence of ID-7, the case of Neville Reed, who was deemed not liable for his actions. His first meeting on this fateful day is with Melanie (Samara Weaving – The Babysitter, Home and Away), a furious client who wants an extension on a loan to keep her home. Shortly after, he discovers that he has been framed for a blunder on a major case by Kara “the Siren” Powell (Caroline Chikezie – Eragon, The Double Deal) and subsequently fired by the head of the Board of Directors, John “the Boss” Towers. This is when his day gets even worse. As he’s being escorted from the building, it is surrounded and cordoned off by the CDC, they have detected ID-7 in the air conditioning and are to be quarantined for eight hours while it is neutralised. As things begin to degenerate and the office staff start acting on their basic instincts, he teams up with Melanie as they realise they can take revenge on the Board of Directors without fear of repercussions if they can just make it to the top floor. Mayhem is a very entertaining watch. It’s a great idea for a story, well written and well acted and hilarious from start to finish. There’s plenty of blood and guts and be warned, there’s a huge amount of swearing so it’s not one for the faint hearted. A must own for fans of horror and probably also for anyone who works in an office! Well worth adding to your collection. 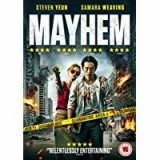 Mayhem is available to buy now on DVD.